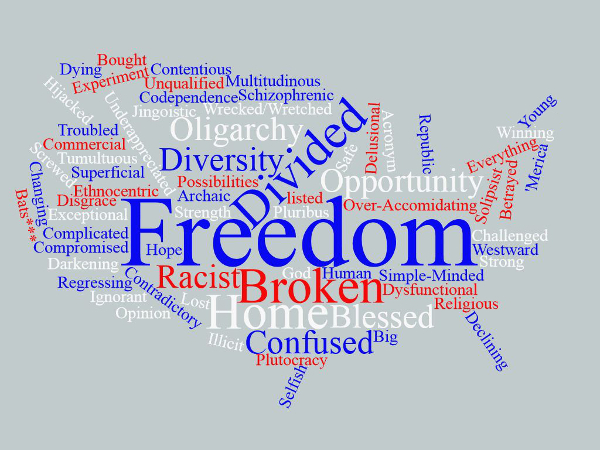 America in One Word: Your suggestions (click for full size). I asked friends on facebook to describe the USA, America, in one word. I was surprised at the number of people who responded. Some were positive and optimistic, but many of them were negative and jaded. We live in contentious times. One college classmate gave the completely accurate but snarky answer for the USA, ‘Acronym’. (For the other suggestions to describe America in one word, see below.) The most common suggestion was what I expected, ‘Freedom’. That, of course, is one of the things we pride ourselves upon, but several people pointed out that our freedoms are not complete, we are not completely free. That is certainly one of my concerns with ‘freedom’, and one of the reasons for this post. Probably the most accurate response, though, was the man who suggested, “All of the Above!” In an egalitarian, democratic state, with guaranteed freedom of thought and expression, all opinions are valid. Which brings up another point. One person eMailed me, and expressed his disappointment with the negativity. I did a quick count, and the positives and negatives were roughly equal. We’re in a contentious time, but dooms-dayers have always been around. End-times predictions are certainly part of the Christian tradition, which has played an important role in our country’s history. Of course, there were also words that might seen negative, but I would argue are really positive, and are even sources of our strength. They come under the heading of ‘diversity’; not simple racial diversity, but intellectual diversity, a diversity of opinions and a diversity of skills which make our system dynamic, flexible, and robust. Those include words such as: Challenged; Complicated; Contentious; Contradictory; Divided; Multitudinous; Opinion; Troubled; Tumultuous. Those, in turn provide a different consideration of ‘schizophrenic’ in the popular sense of the word.1)In the popular interpretation, schizophrenia refers to someone with conflicting personalities/thoughts. The medical use of the word refers to a different, very deep dysfunction. I wanted to get some ideas before weighing in with my own suggestion. For some years I’ve been searching for a single word that might describe us. Mind you, I’m no jingoist; the USA has problems. So does every country; in fact, that is one of the insights. The question isn’t, Who has problems? The question is, Who is addressing their problems? We can’t address our problems if we ignore and deny them. We have our strengths, too. Technologically and economically, we’re the best in the world. In the liberal arts, we hold our own. Our cuisine lags. Socially, we’re an odd mix: I think we have one of the most democratic and fluid social cultures in the world, with ‘rags-to-riches’ stories reaching the point of triteness. And at least on some fronts we implement social change rather quickly; we went from the Montgomery Bus Boycotts to an African-American President in just over 50 years. We are nevertheless remarkable. Our adversaries, such as the Russians and Chinese, point out that we are simply lucky: we inherited (stole, really, but so did every country) an enormous territory with a temperate climate, rich soil, and tremendous natural resources. Those observations are true. Another, often unmentioned advantage, is that we are largely isolated. To the north we have Canada, with whom we share many cultural and political traditions. Our only truly exotic neighbor is Mexico, to the south. But that’s it; except for a few Caribbean islands, we have no other neighbors. The point of that is, we have been able to largely avoid war in our country (although yes, we have gone to war with Canada and Mexico, but that was a long time ago). There has not been a significant invasion of the USA since the War of 1812, and the bloodiest war we fought was an internal conflict, the Civil War which ended 150 years ago. This not only leaves us with great stability, and without large diversion and destruction of our resources and infrastructure, but it also leaves us optimistic, and less fearful/neurotic than other countries.3)I once read an academic paper contending that Russia’s national character of paranoia and pessimism dates back to the ravages of Genghis Khan, 700 years ago. Conquest is horror. With apologies to the Russians and Chinese, however, those alone are insufficient to explain our success. We can point to any number of struggling countries that are rich with resources, and which have avoided recent invasion, some of which are rather large. To understand the USA, it is critical to include our laws, our traditions, and our culture. In particular, we must consider the Big 3 Freedoms, the ideological concepts which are strongly identified with America since 1776, and with all progressive countries: democracy; free markets; and freedom of expression. Only the third is original to the New World, but the USA has largely defined all of the Big 3 Freedoms for the modern nations. Those are three concepts, however, not one. And those three alone are still insufficient to explain us, or more to my point here, to protect us. Hitler was democratically elected; free markets are vulnerable to exploitation by monopolists and profiteers; and freedom of expression allows for dishonesty and populist inflammations, which can also be used to undermine our system. The Big 3 Freedoms can be used to undermine the freedoms they are designed to protect. So I have been looking for a single concept which may unite the Big 3 Freedoms, and which might add nuance to our understanding, and help us guide for adjustments as we go. After years of thought, let me suggest a rather ungainly word: feedback. The word is fairly new. The OED says it first appears in 1923 in Harmsworth’s Wireless Encyclopedia. Harmsworth simply defines feedback as a power transfer from one part of a circuit to another. The concept has advanced since then. 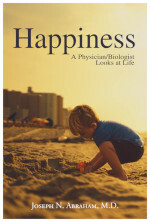 In biology, Claude Bernard and Walter Cannon introduced the concept of ‘homeostasis’, the idea that biological systems such as temperature, pH, salt content, and others, are tightly maintained within narrow ranges, which we can now show is accomplished through a complex system of feedback loops. Feedback loops are also, not surprisingly, fundamental in artificial intelligence, robotics, and cybernetics, where homeostatic systems are critical to logical behavior. And if you consider the Big 3 Freedoms of democratic government, you can see that what unites them is that they guarantee feedback loops. Don’t do your job in government, you (and possibly your party) will not be re-elected, and may even be recalled. Don’t do your job in the marketplace, and your business will be out of business. As for freedom of expression, that is a feedback loop in and of itself. It provides a feedback loop for all other activities. The Founders started with their own experiences in their problems and complaints dealing with England. The colonists could be manhandled by British occupying forces, but they were often defrauded by British merchants as well, without practicable recourse for either, without effective feedback. Benjamin Franklin is a good case study: the Pennsylvania Assembly sent him repeatedly to England to deal with the abuses of the Penn family and the Crown toward them. Franklin left a royalist, but the incompetence he experienced—i.e. the lack of a feedback loop—and the bored indifference of the Crown and nobility where again there was no feedback loop, convinced Good Doctor Franklin to become an ardent republican. The insight of a feedback loop appears to be a pretty good corrective, and protective. Hitler was democratically elected, but like all dictators, he eliminated feedback loops: critics, particularly those in the press, were regular assassinated, even before Hitler became Chancellor. Monopolies work under the rubrics of free markets, but they also eliminate the free market, and with it, the possibility of feedback loops. If there are no competitors, if consumers have no options, then feedback is muzzled. In a world that is changing rapidly, those problems leave the monopolist’s industry, and his host nation, at a great disadvantage. And then there is freedom of expression, particularly of the press. Increasingly, the press is becoming largely immune to any concerns beyond the financial. Less and less do they cover news in a global way that improves the citizen. More and more do they publish the news in whatever way most profits the owners. First, that means that news changes from global considerations to an emphasis on pop culture. The media also focuses on anger, which is highly profitable. It also leaves the citizen vulnerable to the other eliminators of feedback loops, despots and monopolists. If media doesn’t cover the news in a way that serves their advertisers, i.e. the powerful and profitable, they will exclude that media outlet from their advertising revenues. So frequently, we may not even hear about corporate and oligarchic skulduggery. Here, however, the feedback loop of boycotts provides a remedy. Recently, various political and special interest groups have been able to wield power against power, by refusing to purchase from industries that interfere with politics and the press. Rosa Parks and the Rev. Martin Luther King used the Montgomery bus boycotts to change the character of our democracy. So we see that the vulnerability of the Big 3 Freedoms is also their value: the feedback loop. Eliminate the feedback loop, and our laws and rules are nullified. Without feedback, there is no freedom. This also explains the constant criticisms of the advanced nations which come from the ‘second world’ countries4)Countries which have the intellectual and technological tools to move forward, but which are held back because of primitive political systems which lead to depressed wages and a lower standard of living, most notably Russia and China. The leadership of these countries point to the stumbles and embarrassments in the advanced countries, and offer this as proof that we are not actually advanced. The reality is, our stumbles and embarrassments are proof our our strength; interpreting it otherwise represents an antiquated way of looking at strength, and progress. In a static world, strength is doing the same thing repeatedly, and doing it effectively. But in a world that is progressing rapidly, experimentation and failure are essential. Which brings us back to the considerations of ‘diversity’, above. The claims that we are divided do not prove that we are weak, they show that we are open, they are evidence that continued progress is possible. It is only to would-be monarchs and monopolists that disagreement is seen as weakness. And so countries like Russia and China have not yet fully abandoned monarchy and monopoly. Our stumbles, and our tolerance for diversity and error, are proof of our strength. To remain competitive in a changing world, debate, difference, and even default, are essential. The Chinese and Russians miss the strengths in our processes, and those strengths are the same feedback loops that those governments often block. If the right feedback loops are in place, all problems will correct themselves. Use the buttons below to share this on social media. Archaic; Bats***; Betrayed; Big; Bought; Challenged; Changing; Codependence; Commercial; Complicated; Compromised; Contentious; Contradictory; Darkening; Declining; Delusional; Disgrace; Dying; Dysfunctional; Ethnocentric; Exceptional; Experiment; God; Hijacked; Hope; Human; Ignorant; Illicit; Jingoistic; Lost; ‘Merica; Multitudinous; Opinion; Over-Accomodating; Pluribus; Plutocracy; Possibilities; Regressing; Religious Freedom; Republic; Safe; Schizophrenic; Screwed; Selfish; Simple-Minded; Solipsist; Strength; Strong; Superficial; Troubled; Tumultuous; Underappreciated; Unqualified; Westward; Winning; Wrecked/Wretched; Young. 1. ↑ In the popular interpretation, schizophrenia refers to someone with conflicting personalities/thoughts. The medical use of the word refers to a different, very deep dysfunction. 2. ↑ Except for the Vatican, of course. 3. ↑ I once read an academic paper contending that Russia’s national character of paranoia and pessimism dates back to the ravages of Genghis Khan, 700 years ago. Conquest is horror.